At a crossroad: can small businesses continue to thrive in one of San Francisco’s last working-class neighborhoods? 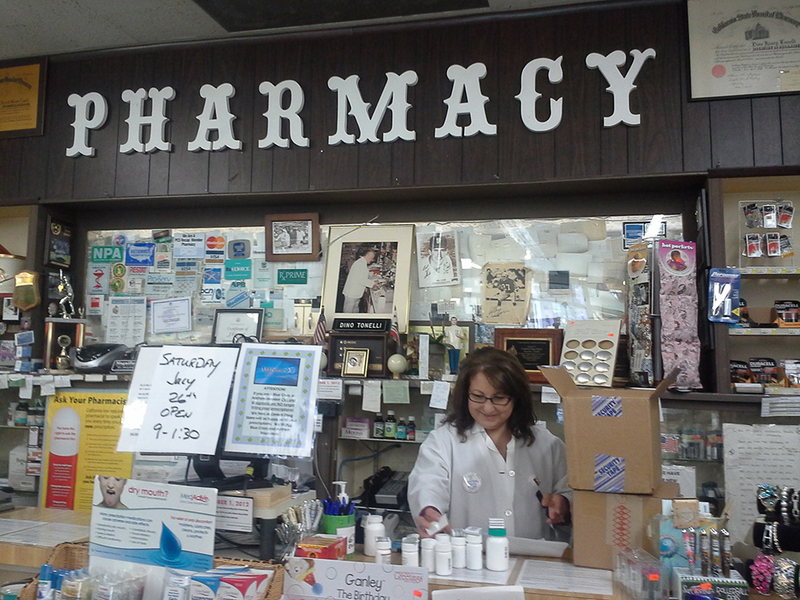 Toni Feretti sorts prescriptions at Central Drug Store in the Excelsior on July 24, 2014. There should be more support for small businesses in the neighborhood, she said. Photo by Mary Strope/Bay News Rising. A couple of slices of Dutch Crunch, some imported Mortadella and a splash of olive oil. Mike Tufo, co-owner of Calabria Brothers Deli in the Excelsior district, could make the intricate, layered sandwiches offered in his gleaming, orderly deli with his eyes closed. “We are the last of the Mohicans,” Tufo said, referring not to the deli—one of the few remaining Italian businesses left in a once largely-Italian neighborhood—but to the neighborhood itself, which is one of the last working-class areas in the city. With a $15 minimum wage proposal on the ballot this November, and commercial rents skyrocketing, many Excelsior business owners fear the challenges ahead. Not to worry, said Lily Wong, who connects youth and low-income earners in the neighborhood to employment opportunities through Coleman Advocates for Children and Youth. Coleman Advocates backed San Francisco’s first minimum wage initiative in 2002, which brought up many of the same concerns affecting small businesses. “A lot of the fears people had didn’t really come to fruition,” Wong said, noting that the current wage increase should help workers forced to take on multiple jobs scale down to a more reasonable one or two. The minimum wage debate focuses too often on the business economy, and less on the impact it will have for families and young people, Wong said. In a city increasingly associated with wealthy, white and childless single adults, the Excelsior boasts a diverse population with a high concentration of families. Children still play on the streets, and on warm days, residents barbecue and play mariachi music in backyards or on sidewalks. “It’s the last neighborhood that doesn’t just welcome a ‘certain kind’ of people,” Tufo said. A lifelong Excelsior resident, he praised its diversity and sense of community while bemoaning its lack of recognition and support for small businesses. They compete not only with chain stores and the Internet, but with the branded, Kickstarter-funded establishments that are so attractive to the tech crowd. Though there are exceptions, most stores in the Excelsior don’t have an online presence or a social media guru. Instead, they run on a more traditional “Main Street” model: Mom and Pop hardware stores, inexpensive hair salons, even old-school independent pharmacies, that are all within walking distance of each other. Yet until somewhat recently, there were few vacant storefronts on the Excelsior’s Mission Street. Even when empty stores lined retail-dense stretches like Union Street during the 2007-2009 recession, the Excelsior maintained its bustling business district. Today, customers line up to order tacos at El Farolito on Mission Street near Russia Avenue or they buy fresh fruit and vegetables at El Chico Market on the corner of Norton Street. But the area’s retail district has its problems. Longtime neighborhood businesses like Joe’s Cable Car and the Chick-N-Coop now stand empty, and many shopkeepers say the neighborhood could use more security and upkeep. Even in the heart of the booming Mission district, landlords often let commercial spaces sit empty as they await a chain store or other big-ticket client. Small, neighborhood businesses often bear the brunt of these practices. Without the rent-control protections enjoyed by San Francisco’s residential tenants, or the business tax breaks Mayor Ed Lee has awarded to big businesses like Twitter, their situation is often precarious. That doesn’t sit well with Gwynn Mackellen, safety coordinator and former interim-manager of Excelsior Action Group, a city-run organization that’s focused on revitalizing the neighborhood. Mackellen wants to see those empty commercial spaces filled. Pushed out by steep rents in other neighborhoods, store owners often look to the more affordable Excelsior. Yet even here, high rents can be a detractor. More than half of all small business owners are foreign-born in District 11, which includes the Excelsior, Ingleside and Outer Mission areas. Navigating the complex world of permits, licenses and taxes with a language barrier is often another challenge for them. “We’d like to see more support and outreach by the city in different languages,” Mackellen said. “This was always a very family-oriented neighborhood,” said Laura Cruz, as she placed a delivery order for Little Joe’s Pizza, another longstanding local business. An Excelsior native, Cruz is a pharmacy clerk at Central Drug Store, located at the corner of Santa Rosa Avenue. And business has been good. The family-owned drug store has sat at Mission Street and Excelsior Avenue for 106 years, It’s the kind of homey place where the workers greet you by name and every holiday gets its own themed window display. A shiny black tile front and vintage neon sign make up the facade, and a colorful mural of local boy Jerry Garcia, who grew up on nearby Harrington Street, festoons the side of the building. In San Francisco, formula retail stores must be approved by the neighborhood before moving in. A proposed Starbucks was rejected in the early 2000s on Geneva Avenue, in the Crocker-Amazon neighborhood which borders the Excelsior, but today many cite Starbucks as a needed neighborhood booster. Once the popular chain becomes part of the neighborhood, cleaner streets and more shoppers will follow, or so the theory goes. Today, many bring up the Starbucks conundrum when they talk about the Excelsior. Why should a major chain have to move in to validate the neighborhood, or make it worthy of cleaning up? On the other hand, some businesses can benefit a neighborhood via a sort of capitalist ripple effect. Mackellen can see both sides of the coin when it comes to chain stores. Like others, Linares cited a lack of action on behalf of the city when it comes to improvements in the Excelsior. There used to be someone who came and cleaned up the garbage outside, but today the streets are dirtier than ever, she said. A call to 311 ended with a promise from the city to steam-clean a particularly grimy stretch on Mission Street between Persia and Brazil avenues, with a three-day promised response time. While this solution is not as sustainable as an ongoing community effort, reaching out to the Department of Public Works did yield some results. “There is no regularly scheduled sidewalk cleaning because sidewalk cleaning and maintenance is the responsibility of the fronting property owner,” Jeremy Spitz, a Department of Public Works spokesperson, told Bay News Rising via email. In wealthy neighborhoods like Noe Valley, merchants’ associations put pressure on landlords of large, anchor businesses to fund regular sidewalk sweeping and steam-cleaning. Wealthy newcomers end up enjoying these results while longtime residents and business owners—who contributed to the neighborhood and its culture for year—are forced out. This entry was posted on July 30, 2014 by skettios99.